Offer suet to woodpeckers, chickadees, and nuthatches in an environmentally sound way using the Songbird Essentials Green and Brown Upside-Down Suet Feeder. The unique, inverted design of this item inhibits larger, non clinging birds such as starlings and blue jays from raiding it, for a station your small birds are sure to enjoy. A large, recycled plastic roof protects the reservoir underneath it, which easily holds a standard suet or seed cake. A durable frame of this same material offers strength and stability to the item, while coated wire fencing on the base supports the suet cake. The 1" x 0.5" openings here allow clinging birds to dine, and the piece is simple to clean and disinfect. Crafted from recycled plastic, this feeder will certainly last year after year, while diminishing landfill waste. The brown and green color scheme blends with your landscaping, and an attached steel cable makes hanging the item simple. 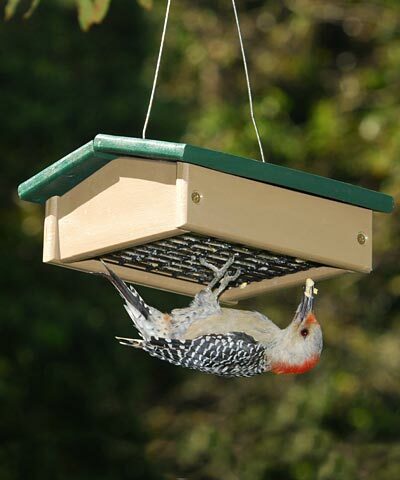 Add a fun feeder to your bird garden with this Green and Brown Upside-Down Suet Feeder. Lifetime guarantee. Whitehall Cardinal Nature Hook, Copper Verdi, 14.75"